Dutch town bikes all have a lock permanently fitted onto the frame, securing the back wheel. 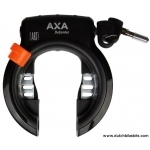 Of these, the AXA Defender bicycle wheel lock is one of the strongest currently available. 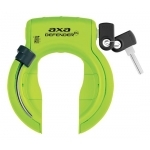 AXA also sell lower cost locks (Solid and other models) but we don't offer them as this top of the range model is affordable enough. 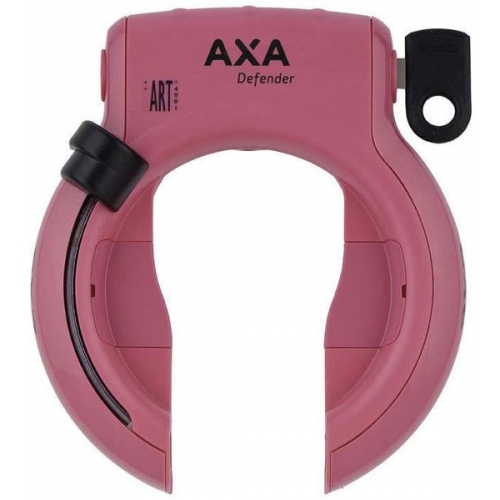 Why pick the AXA Defender ? 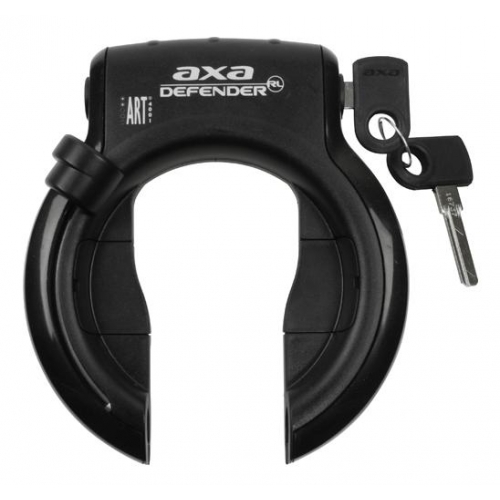 The AXA Defender bicycle lock is incredibly convenient. You cannot leave home without both your lock because it is attached permanently to your bike. You can't leave without the key because when the bike is not locked, the key is secured to the lock and cannot be forgotten. For safety, there is an interlock which prevents the lock closing as you ride - the key needs to be turned and the lever simultaneously pressed to lock the bike. Once locked, the key is released for you to carry with you. On return the lock again securely holds the key. These locks are also very quick to use. You don't have to dig around in in panniers or bags to find a lock or spend time poking it through your wheel. It's already there. Extra cables and chains which plug into the side of this lock can be used to make your bike more secure. Cables provide the lightest weight extra security, but chains are more secure, and the top product is especially secure. All these operate using the same key and simply click into place. These optional cables and chains are sold separately. Please see the related products. Additional photos show AXA Defender locks as fitted on our family's bikes, and how one of the optional cables attaches to the side of the lock. One of the photos shows the dimensions of the lock so that you can make your own mind up whether wide tyres will fit. This is a subtantial lock which is ART registered, meeting the requirements of Dutch insurance companies. The lock also meets requirements of British, Danish, Finnish and Swedish insurers (if this is important to you, check with your own insurer before ordering). Weight of the lock is 750 g. Lighter lookalike locks are available, but they're usually not so secure. In English, these locks are sometimes known as "Wheel Locks", "Frame Locks" or "Nurses locks". 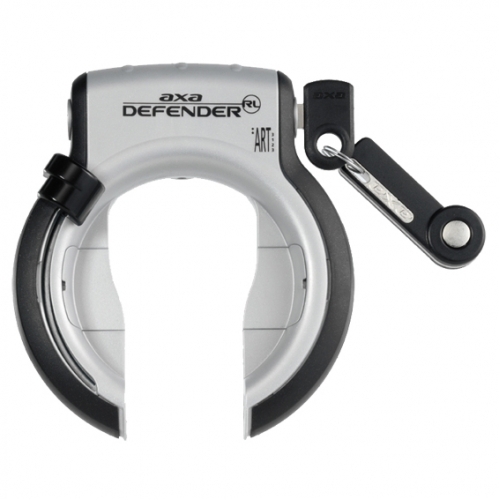 Whatever you call them, the Defender is one of the best, most secure, available. Two keys are supplied. 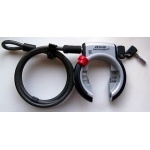 The style of the key fob varies but the lock itself is just as secure in all instances. The locks come in one size, but we have a range of mounting options available. Normally locks are fitted on the seat stays of a bicycle. 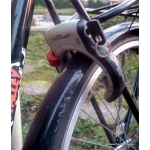 The standard mounting parts use a band which pulls tight and works for almost all bicycles. Optionally you can choose the older hook style mounts which come in two sizes for different diameter seat stay tubing. The older style mounts require covers to hide them for neatness. These are provided with the lock. Each of the mounts are all also available separately. If the mounting position on your bike will conflict with the position of V or cantilever brakes then you should order no mounting option (which gives a small discount) but also add the optional V / Cantilever brake mounting kit to you order. This mounts the lock slightly above your brakes. Please see the "additional images" to see how this works. In "additional images" you'll find a photo which has the internal size of the lock shown upon it. If the Defender is too small to fit your bicycle, consider the AXA Victory lock which accommodates wider tyres. People often ask us where they can buy replacement keys for AXA bicycle locks. We don't sell replacement keys but you can order them online directly from AXA. Note that if you are considering buying a replacement key for an AXA SL series lock we suggest that you buy a replacement Defender instead. The SL series are not secure. Videos on youtube show how to open them. 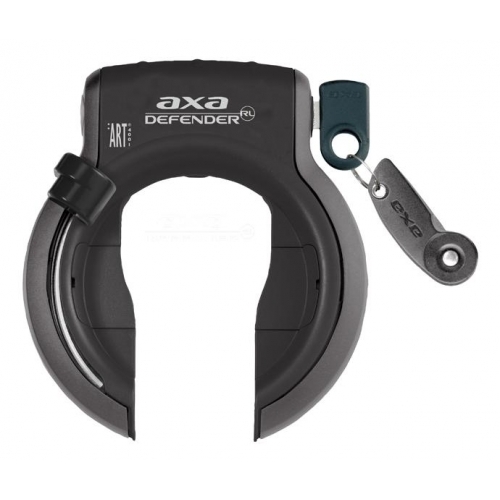 Our price for the much superior and very much more secure Defender, including two keys, is only about 3x the price that AXA charge for a single replacement key for the obsolete SL7 and SL9 locks. 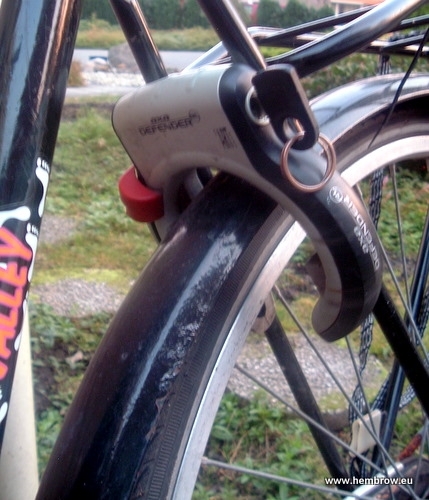 As with all proper Dutch locks, the key is retained by the lock when the bicycle is unlocked. This is very convenient. You cannot possibly leave home without the key to your bicycle.